Art and design is everywhere in Barcelona, on every street, building, museum and art gallery students will find things to inspire their creativity. Scattered around the city are the unique works of Gaudi including Parc Guell and, the still unfinished, Sagrada Familia Cathedral; Barcelona’s most emblematic symbol. Combine this with the city’s world class museums as well as institutions devoted to Picasso and Joan Miro and you have the perfect recipe for an art trip. This exceptional city is a must at any time of year and has teachers returning year after year. 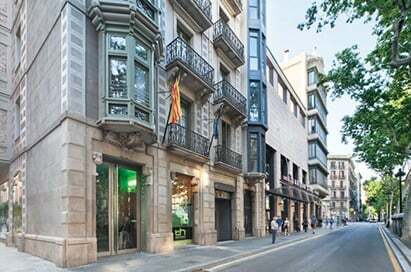 The Barcelona Museum of Contemporary Art is situated in the Placa dels Angel’s area. In 1959, art critic Alexandre Cirici Pellicer formed a group of contemporary artists showing work in a series of 23 exhibitions, with the hopes of beginning a collection for a new contemporary art museum in Barcelona. In 1986, the Barcelona City Council recommended the American architect Richard Meier Partners to design the museum. The permanent collection of around 5,000 works dates from the mid-20 th century onward. The three periods of modern art represented are the forties to the sixties, the sixties and seventies and the last are contemporary. 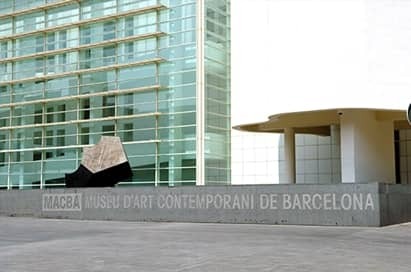 The collections focus on post 1945 Catalan and Spanish art, and the museum also stages seasonal exhibitions, which can be viewed on the museums website. This is a great experience for students to observe contemporary artwork in a beautiful building with stunning views from Barcelona through the glass panels. 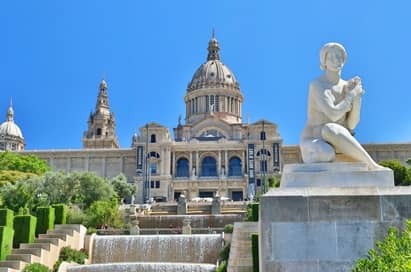 The museum of National Art of Catalunya is located in the Palau Nacional; the MNAC contains the world’s most important collection of Romanesque art as well as the gothic art section and the Cambo collection. The collections date from the 10th and 20th century offering a complete exhibition encompassing all art disciplines (sculpture, painting, drawing, engraving, posters as well as photography and coin collections). The museum aims to give a vision of art in Catalonia throughout history. The collection features works by artists such as El Greco, Zurbaran, Velazquez, Fortuny, Gaudi, Casas, Torres-Garcia, Dali, Julio Gonzalez and Picasso. The museum has plenty to offer students with beautiful collections offering great insight into ancient collections. 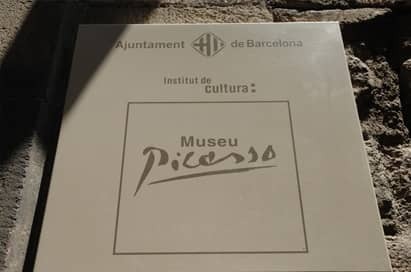 The Picasso museum is located in the quarter El Born and was founded after Jaime Sabates, the former secretary and friend of Picasso, devoted a large collection of works to the city. For this purpose the Palacio de Berenguer d’Aguilar, an old city palace from the 15th century, was converted into a museum to house the collection. The Picasso Museum in Barcelona reveals the genius of the young artist through more than 3,500 works that make up the permanent collection. The museum also reveals his relationship with Barcelona an intimate, solid relationship that was shaped in his adolescence and youth, continuing even after his death. This is a fantastic opportunity to see Picasso’s younger works of art and his early influences. The heart of the museum is the building that housed the town’s theatre when Dali was a child. 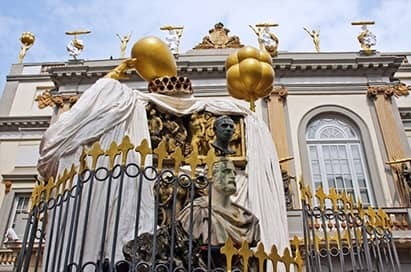 The museum displays the single largest and most diverse collection of works by Salvador Dali, the core of which is the artist’s personal collection. It contains the broadest range of works spanning the artistic career from 1980-1989. In addition to Dali paintings from all decades of his career, there is Dali sculptures, 3-dimensional collages, mechanical devices and other curiosities from Dali’s imagination. 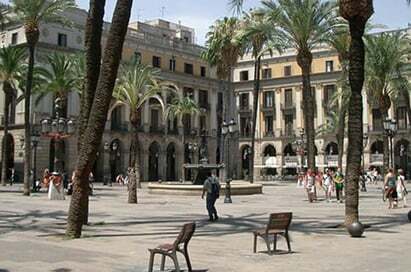 Figueres is situated around 75 miles from Barcelona. The Fundacio Joan Miro Foundation, founded in 1975 by Joan Miro himself, is located in the museum on the mountain Montjuic. The wide variety of techniques he used in his career are widely represented by the more than 14,000 exhibits on display. 217 paintings, 179 sculptures, a variety of prints and textiles and over 8,000 drawings, which provide an in-depth understanding of the creative process of the Catalan genius. 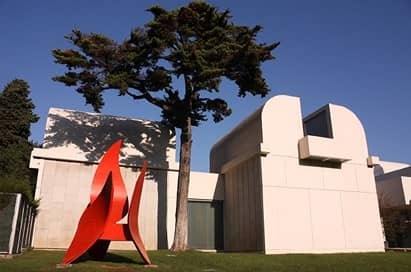 In addition to the works by Joan Miro, the foundation also has a small collection of contemporary art consisting of gifts and loans from leading artists. Mis van der Rohe built the German pavilion for the World Exhibition 1929. Following the exhibition the pavilion was deconstructed in 1930, and after various initiatives rebuilt at its original place between 1983 and 1986. The rebuild is a striking demonstrator of rationalist architecture and The Bauhaus style can clearly be recognised in the pavilion. The innovative architectural structure of the rebuild represented a radical change in the layout of space, and has had great influence on the development of modern architecture. The pavilion houses the Barcelona Chair which Mies van der Rohe created exclusively for the space. 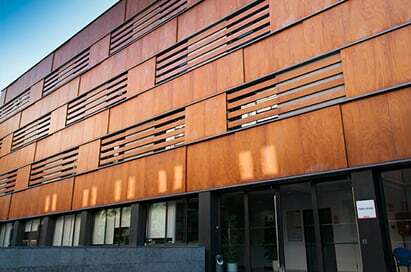 CaixaForum is housed in a former textile mill built in 1911 and designed by the modernist architect Puig I Cadafalch. It now hosts a wide variety of interesting cultural activities, exhibitions, and displays an exhibition of works from the Foundation contemporary art collection. 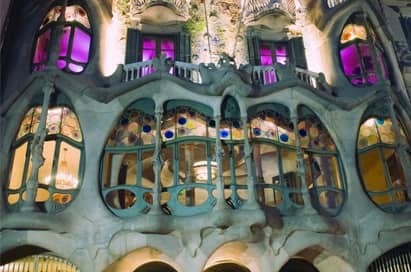 The last apartment house built by Antoni Gaudi, the Casa-Mila (or “stone quarry” as it is affectionately known) is considered the epitome of Modernism with its impressive façade of undulating stone and iron balconies. Groups of more than 15 should book in advance. Guided tours are available in English and Spanish. There is an accompanying exhibition, Espai Gaudi. 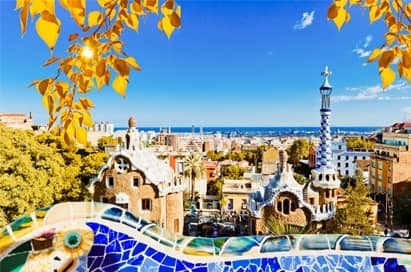 Park Güell has the appearance of something from a fairytale: it is strange, eccentric, even somewhat dream like but undeniably beautiful. The park has the ability to awaken even the sleepiest imaginations. This leafy park in the north of the city contains more examples of Gaudi’s work, namely a series of colonnades winding up the hill leading to a large central terrace projecting over a hall with a forest of distorted Doric columns. The park contains amazing stone structures, stunning tiling and fascinating buildings. At the entrance to Güell Park there is a picture showing the Guadi dragon fountain. The dragon is adorned in beautiful coloured tiling with something rather hypnotic and magical about it. At the top of Güell park is a terraced area where you get a wonderful view of the park and of Barcelona City. The vibrant colours of the tiles are truly breathtaking. The Güell Park is a fantastic example of a movement of contemporary art guaranteed to inspire many students. The Gaudi museum offers great opportunities to learn more about the life and work of visionary Catalan architect, Antoni Gaudi. The house was designed by Gaudi’s colleague Francese Berenguer, Gaudi did have a hand in designing the garden pergala and the beautiful furniture. Bookings are not required. Student groups cannot enter between 14h00 and 16h00. Worked on for over 100 years, the Sagrada Familia represents Gaudi’s dedication to build a church replete with precise symbolic meaning. The irony is that this masterpiece was unfinished by the time he died in 1926 and is still unfinished today. Located in the church crypt, the museum tells the story of how the building work evolved. The Museu del Disseny de Barcelona is an important museum in Barcelona dedicated to design, fashion and decorative arts. 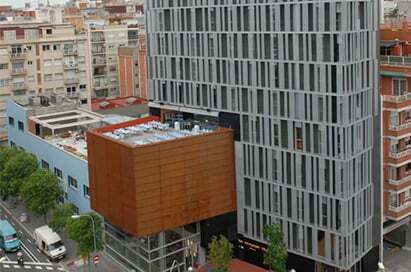 It is housed in the Edifici Disseny HUB a new iconic building designed by MBM architects. The Museu del Disseny collections were previously conserved in four different museums: Museum of Tissues and Dresses, Museum of Ceramics, Decorative Arts Museum and the Gallery of Graphic Arts. The permanent exhibition of the museum is divided into four thematic sections, each being located on a different floor level: industrial design, decorative arts, fashion and graphic design. These exhibitions feature a large number of rare and interesting objects dating from 3 rd century to present day, as well as documents, videos and interactive exhibits that help to contextualise the exposed artefacts. The collection ranges from 12th century Arabic pieces and traces the history of glazed Spanish ceramics until the end of the 19th century through to contemporary pieces by Artigas, Cumella, Miro, Picasso and others. The museum also holds a range of temporary exhibitions, special events and conferences. This new exhibition enables students to delve into Gaudi’s creative universe. 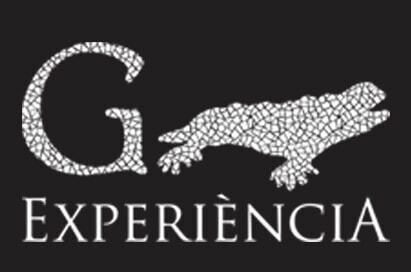 The Gaudi experiences allows students to take an interactive and 4D journey of the Modernist Architecture at the G Experiència, and discover what lies behind Antoni Gaudi’s innovative architectural language. This new cultural tourist attraction offers a different and unique way to know Gaudi and his numerous works through state of the art audiovisual technology. There is a 4D-seated presentation of his life with surround sound, stereoscopic vision and moving seats with special effects. This is the first centre dedicated solely to presenting Gaudi’s life and works. Very helpful and easy to contact whenever I had a question. The guide at the Olympic stadium was very good and friendly. Everything was very well organised and I felt supported at all times. Booking our visit with EST was an enjoyable and easy experience...Faultless customer service. Thank you! We cannot thank you enough for making this tour so memorable. 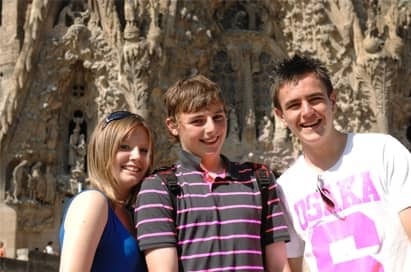 This was my first visit abroad with students but I really felt like someone was with me all the time - it was perfect. I don't bother shopping around - I only use EST and enjoy and appreciate the friendliness, helpfulness and patience from all of the staff!